Many Features set the Virtual Lender apart from other products on the market today! One in particular is the Virtual Lender Rapid Design Desk. 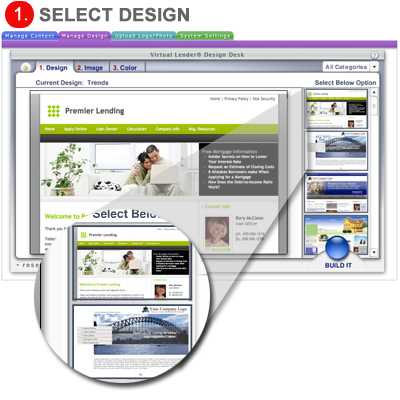 In a nutshell the Design Desk allows you the flexibility to change your web site design at anytime selecting from 100’s of pre-built professional web site layouts. Aside from being called the most advanced and robust mortgage website builder in the industry. 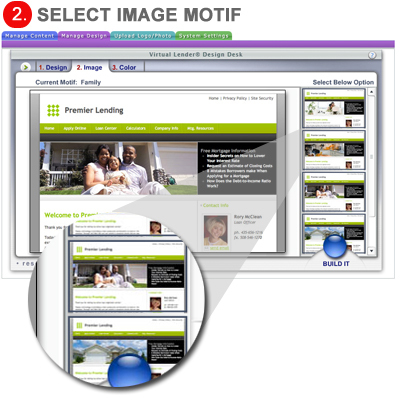 The Virtual Lender Design Desk is known for its ease of use. You simply select the design you would like to implement for your web site. Choose the perfect color and click the BUILD IT BUTTON. In Seconds the Virtual Lender will construct the chosen design and publish all your existing content to the web using this new design. The amazing thing about the Virtual Lender Design Desk is the fact that you can change your website design as often as you like for no additional cost. We understand that a mortgage professional needs to act quickly when promoting new loan programs or niche products. The Virtual Lender Rapid Design Desk will help you accomplish this. For example: If you wanted to promote VA products you might select a design that is Red, White and Blue with a picture of a flag on it. Click the Build it Button and go to work promoting your VA loan products. This will create a brand not only for yourself but also for the loan products you offer. 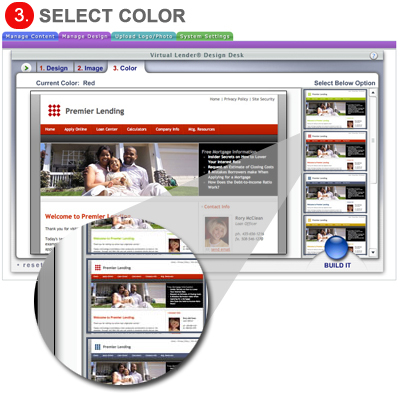 The Virtual Lender Rapid Design Desk is the ONLY website builder that provides this level of customization and Flexibility. No other product on the market even comes close to the power and flexibility of THE VIRTUAL LENDER DESIGN DESK.